Read the latest news and blog articles from Zooga Yoga in Culver City, including new location announcements, special sales events, and more. Zooga Spring Camp is here! A Special Valentine’s Pose of the Month! 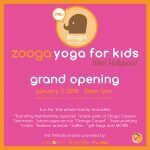 ZOOGA YOGA WEST HOLLYWOOD opens in 2018!